Most Indiana schools do not test for radon gas, a carcinogen known to cause lung cancer, despite federal recommendations that all schools test at least once every five years. 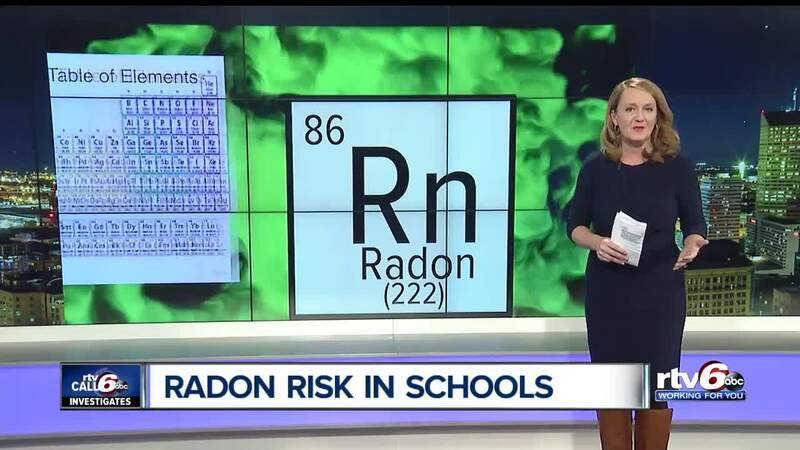 INDIANAPOLIS—Call 6 Investigates has uncovered that most Indiana schools do not test for radon gas, a carcinogen known to cause lung cancer, despite federal recommendations that all schools test at least once every five years. Radon is a radioactive, naturally occurring gas that seeps into buildings from the surrounding soil. It’s the number one cause of lung cancer among non-smokers, killing an estimated 600 people a year in Indiana and roughly 20,000 people across the country. Central Indiana students and teachers spend a lot of their time in schools, and that’s why the EPA recommends schools test for radon but Call 6 Investigates found most school districts aren’t doing it. Annie Cacciato is a wife, a mother, and a survivor. “I have stage four lung cancer,” said Cacciato. Diagnosed in 2013, Cacciato had never smoked. Although there’s no way to prove what caused her lung cancer, radon is the prime suspect. Following her diagnosis, Cacciato learned her workplace and high school contained toxic levels of radon. “I was in shock,” said Cacciato. EPA’s nationwide survey of radon levels in schools estimates that nearly one in five has at least one schoolroom with a radon level above the action level of 4 pCi/L (picoCuries per liter) - the level at which EPA recommends that schools take action to reduce the level. Cacciato has been fighting for her life for five years and wants to prevent others from going through lung cancer. Radon is odorless, colorless and tasteless, and the only way to know if it’s there is to test for it. The EPA recommends schools test at least once every five years. Call 6 Investigates surveyed dozens of schools and analyzed Indiana State Department of Health data and found of the state’s 289 public school corporations only 4% have tested for radon in the last decade. “Let’s just call it out for what it is—it’s negligence,” said Cacciato. RTV6 found large districts with thousands of students like Wayne Township, Carmel Clay, Perry Township, Mt. Vernon, Lawrence Township and Westfield haven’t tested for radon in the last ten years. Some districts pointed out Indiana does not require schools or daycares to test for radon. A dozen states have laws or regulations in place that require or encourage radon testing in schools including Illinois, Colorado, Florida, Virginia, Oregon, Connecticut, Iowa, Minnesota, and Nebraska. Call 6 Investigates uncovered the Bartholomew Consolidated School Corporation found dangerous of levels of radon in 2013, and it’s unclear, what if anything they did about it. The EPA recommends schools take action to mitigate when the radon level hits 4 pCi/L or above. Bartholomew Consolidated schools had not one, but seven schools test above that. Call 6 Investigates did not get answers from the school board or the superintendent via email, so we showed up to a public school board meeting. Call 6: Can you tell us if there was any mitigation or not? Dr. Jim Roberts: There was a test done in 2013. You made us aware of the information. We’re following up and gathering information. Call 6: Have you been able to determine if any parents were notified? Dr. Jim Roberts: I was not superintendent at that point. We’re looking at information. I appreciate you sharing that information with us. Call 6: Is there a public health concern to the kids in those buildings? Dr. Jim Roberts: That’s… again. We are looking for information. Call 6: You have schools that tested at 11, 13. Are those numbers concerning to you? Dr. Jim Roberts: I guess that would be, based on interpretation of those numbers and understanding completely what that means to get a reading. Call 6: Would you consider this an urgent issue? Dr. Jim Roberts: Anything that deals with the safety of our children is an urgent issue. Stephanie Studley, a mother of a kindergartner at Parkside Elementary, became concerned after hearing Roberts announcement. Call 6 Investigates shared with Studley the test results showing a 7.1 pCi/L radon level in 2013 at Parkside Elementary. Kyle Hoylman, managing partner of Protect Environmental, does radon testing for schools, daycares and other buildings in Indiana. Hoylman said fixing a radon problem can be as simple as adjusting your HVAC system. A test can cost a school a few thousand dollars to tens of thousands of dollars. Hoylman emphasized radon is prevalent throughout the entire state of Indiana. “The only way to know if you have a problem, is to have your building tested,” said Hoylman. Call 6 Investigates shared our results with Hoylman that only 4% of schools have tested for radon in the last decade. Annie Cacciato doesn’t know what her future holds, but she’s one of the few to make it five years past her diagnosis. Cacciato advocates for schools to test for radon and started crying as she pleaded for parents to do something. Below is a list of schools that tested for radon and submitted their results to the Indiana State Department of Health.